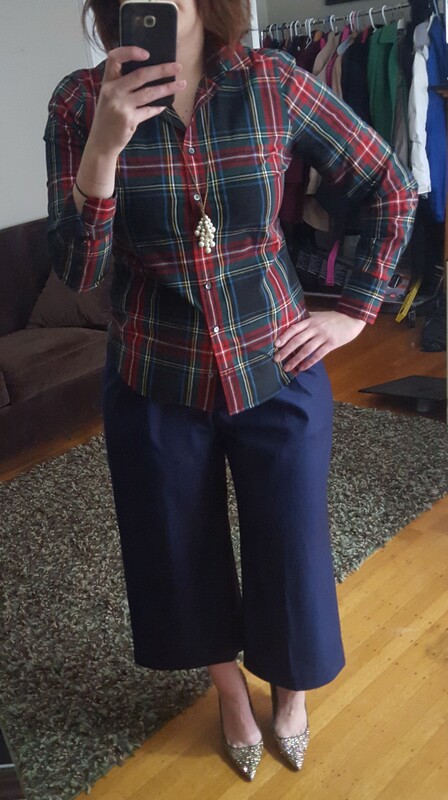 I have been on a mission to find a pair of cropped wide leg pants this season and was to the point where I thought that nothing was going to look good on me until I took a chance and tried the J.Crew Cropped Pant in Wool Flannel in antique navy. I had been eyeing the black and grey version of the Cropped Pants in Wool Flannel (which are a different style number but have the same name and look exactly the same to my untrained eye) but they immediately went to backorder until February (and have since sold out in my size). I forgot about them for awhile until I saw the navy version on Instagram and then as luck would have it I found a navy pair on sale in my size. Based on recommendations to size down, I went with a size 12. I think that if you aren’t curvy, you could definitely go down a size from your usual pant size. The grey and black color are still available on backorder in several sizes. The navy in the pants is a brighter navy, as you can see paired with a darker navy turtleneck. I was hoping the two would match, but that was probably wishful thinking being that the color of these pants is antique navy. I took a large in the turtleneck, and I guess the shrunken description is accurate, it’s shorter than J.Crew’s other traditional merino turtleneck. I would have liked a darker navy in the pants similar to the turtleneck but I don’t mind this shade. They are a lighter weight wool, very soft and the pants are lined. The back of the waist is elastic but there are a few belt loops in the front, which is confusing because I don’t know how you’d wear a belt with these considering the back elastic. So they seem a little wasteful in that respect. 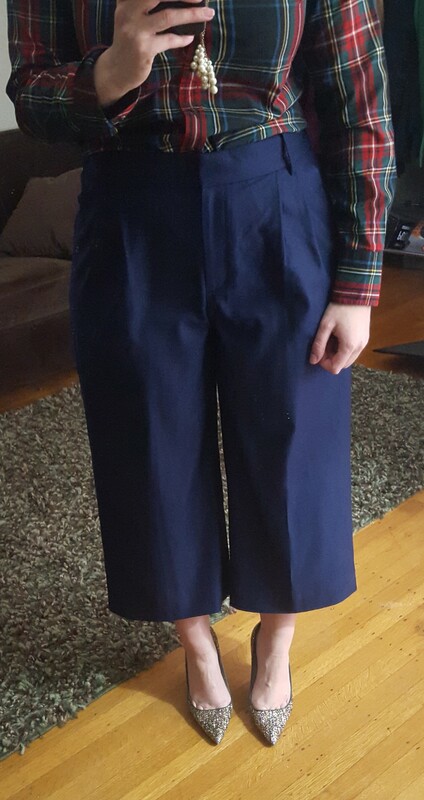 I was also very worried about the pleats – I tried another pair of cropped pants last year with the pleated front and they were horrible. 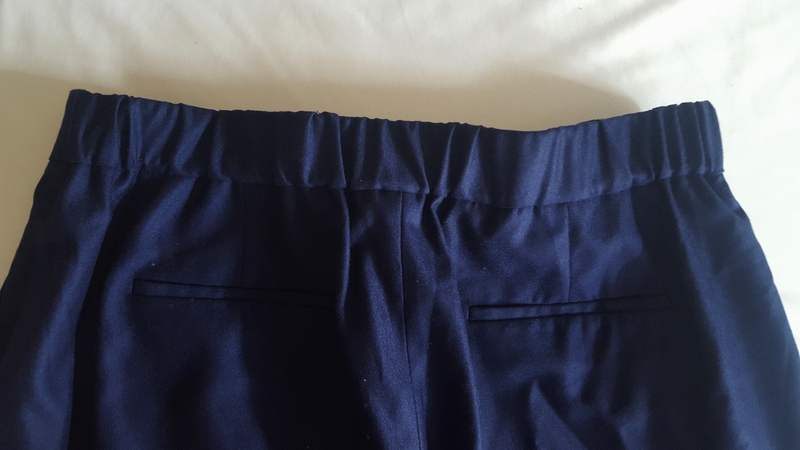 These are a 24 1/2″ inseam vs the 21″ inseam I had tried on other pants and I definitely prefer the longer length. I’m standing in this picture so you can see the two pant legs, but they hit a few inches above my ankle. You can see the angle better in this shot. And this shows the belt loop as well – with the shirt tucked, I feel like you’d need a belt, but again, with the rear elastic issue I’m not sure I would bother. And I don’t really like the full look of the pleats and the waistband with the shirt tucked in. I’d probably wear a top that goes over the waistline with these, such as the turtleneck, Tippi Sweater or an untucked button down. I didn’t try a more delicate blouse tucked in but again, I think I’d be wanting to reach for a belt. And the half tuck…well…I’m not sure about that! I like that the pant legs are wide but not too wide. 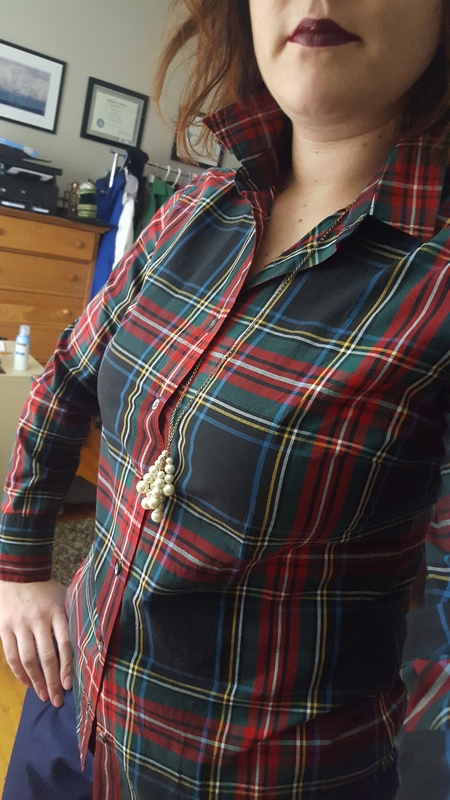 Speaking of button downs, because I needed another plaid shirt (in my grammar school uniform plaid no less) and after seeing the comparison of the previous version with this year’s version, I tried the J.Crew Perfect Shirt in Stewart Plaid. This shirt has been sold out for a while but as J.Crew items tend to do, several sizes have popped back. This is a size 10, which is a size smaller than what I usually wear in button down shirts at J.Crew. Although my tartan perfect shirt from a few years ago is a size 10 and fits me well, the reviews on this version said it ran small. As you can see, it just fits. There’s a bit of a gap in the chest area that you can see if you look closely. It is not tight in the arms though, and overall I don’t mind the fit on this, as I pretty much have to pin the gap at my chest in all of my button down shirts. I do wish it were a little longer, and it’s probably a much larger chance to hold out for a tall version of this to come back in stock. I did find a size 12 in stock when I checked the website after receiving my size 10 and I will soon have that to compare. I really like the larger print on this year’s version and also like the brighter version of the plaid. You can see the other version on me in this post. Excuse my vampy lipstick here, it doesn’t really match the shirt. I was playing around with my new Nars Audacious lipstick in Bette (because I can’t get enough of this lipstick). You can sort of see the gap at my chest in this picture, it wasn’t so bad when I first put the shirt on but after moving around a bit, I knew it would definitely need to be pinned shut. So I’ll wait and see how the 12 fits before I make a decision. 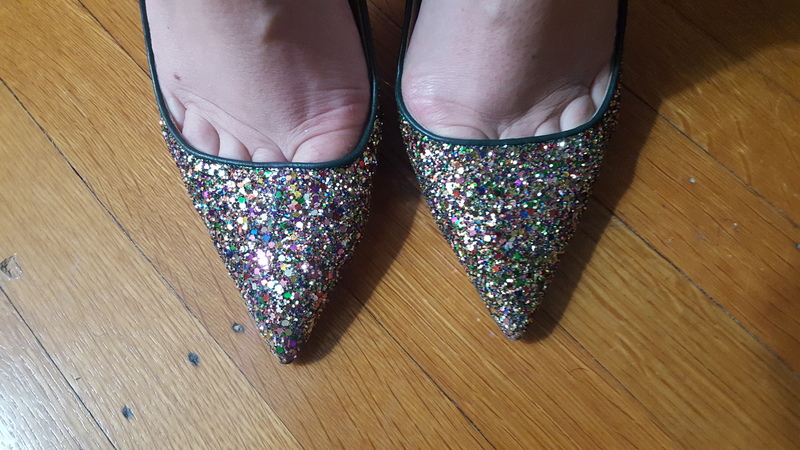 And finally, a close up of my Glitter Elsie Pumps, because why not? I’ve already worn these shoes a few times to work and absolutely love them. So what’s your take on the cropped wide leg pant trend? Have you found a pair that you love or are you passing on this trend? How about plaid? Love it or over it? Would love to hear what you think and thanks for visiting! I think they look fabulous on you and now I want them too! 🙂 Thanks for sharing! Also, I am thrilled to see you get going with the blog again. Yay! These pants are amazing on you, very flattering. I actually like the combo with the darker navy sweater a lot, am thinking that the same color navy would maybe be a bit dull. And ITA with Lindsey: love your IG but the blog is a great addition & more in-depth. Thank you @fleurdelijs ! Sounds like a few people like the navy on navy combo so I think I may try it! Good point on the tones being exactly the same – probably not the same as the dreaded non-matching blacks. And I appreciate the kind words – sort of fell off the blog wagon but now that I’ve gotten a bit of a routine it’s helping and I’m glad to have readers in both spots! I read in the book What Would Jackie Do, that she never wore black on the bottom and white on top, so you’d get Jackie’s stamp of approval with your cream pants and black sweater lol! I love the plaid shoes touch.